Brown some ground beef or diced chicken. Spread your favorite nacho chips on a plate and cover with ground beef or chicken then cover with your favorite cheese then top it off with Sisters Fresh Salsa. Place in the microwave for about 30 to 45 seconds (depending on the power settings) or in a broiler just until the cheese melts. Be sure your cooking surface is safe for the microwave oven or broiler. Give your taste buds the gift of garden fresh tomatoes and onion, flavorful fruit juices and cilantro. 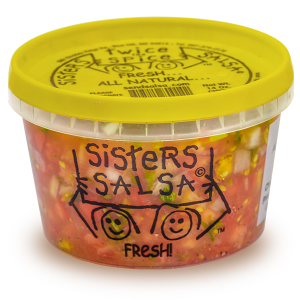 We put them all together and you get hardy, mouthwatering salsa that packs a powerful kick of perfectly blended flavors. Can't decide between our original recipe or twice the spice? Now you don't have to! 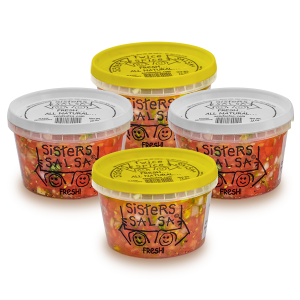 Make your own 8-pack variety case and we'll ship both of our scrumptious salsa's directly to your door. Just like our original recipe, twice the spice unites ripe tomatoes, flavorful onions, and fresh cilantro with a delicious blend of fruit juices to please your palette. We spice it up with twice the jalapeños to give just the right kick! 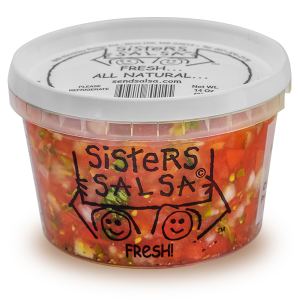 Buy online and have our salsa delivered right to your door!